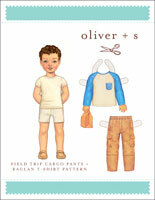 Share your photos on Instagram with the hashtags #sleepoverpajamas and #oliverands. Boy's or girl's pajama pattern. 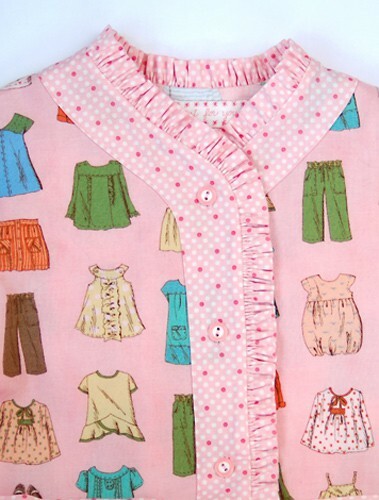 The pattern for this pajama top features contrast trim at the outside edge and on the pockets. The cuff at the sleeves can be let down as the child grows. The elastic-waist pull-on pants have no side seam, to make for extra sleeping comfort, and include a contrast cuff at the hem, which can also be let down as the child grows. View B includes optional ruffle trim. After successfully sewing this pattern, you will have developed the following skills: buttonholes, external facing, flat-set sleeves, gathering, and patch pockets. Fabric B: Lightweight woven fabrics like quilting cotton, broadcloth, lawn, shirting, poplin, voile, and linen. Fabric A: Any Fabric B or flannel. Top: Coordinating thread, lightweight fusible interfacing, 1/2–5/8" buttons (four for sizes 6M-4, five for sizes 5–7, six for sizes 8–12). Pants: Coordinating thread, 1 yard of 3/4" elastic. Optional: For View B, use the View B yardage below, or use the View A yardage and premade ruffle trim (2 yards for sizes 6M-4, 2 1/2 yards for sizes 5-12). Top Length* 13 1/2" 14 1/4" 15" 16" 16 3/4" 17 3/4"
Sleeve** 14 1/2" 15 1/4" 16" 16 3/4" 17 1/2" 18 3/4"
Pants Hip 21 3/4" 22 3/4" 23 3/4" 24 3/4" 25 3/4" 26 3/4"
Pants Outseam 16 1/4" 17 1/4" 18 1/4" 19 1/4" 20 3/4" 23"
Top Length* 19" 20" 21" 22" 23 1/2" 24 3/4"
Sleeve** 20" 21 1/4" 22 1/2" 24" 26" 27 3/4"
Pants Hip 27 3/4" 28 3/4" 30 1/4" 31 1/4" 32 3/4" 33 3/4"
Pants Outseam 25 1/4" 27 1/2" 30" 31 3/4" 33 1/2" 35 1/4"
I have some pros and cons about this pattern. I own the bedtime story pajama pajama pattern an print form and loved it so much. I bought it years ago and used it often, but my grandson is 5 and was too big for that pattern. I was upset to have to buy the digital pattern for $15.00 and then have to print it out. However, I used a beautiful organic knit and was so happy to not have side seams . The pants went together so well as Liesl's patterns always do. I just am upset with the current pricing of the digital patterns. I could not figure out a way to print only the pants. I used a Nosh fabric from Finland. A lovely quick pyjama bottoms pattern. As usual , great instructions - easy and clear. Overall good pattern, I was able to successfully sew up a Peppa pig PJ set for my 3 year old. Fit is pretty true to size. I did find that the cuffs on the sleeve and pant legs got a little bulky and I did have to switch to a jeans weight needle to tack it into place. I also always forget about marking the buttonhole placket at the beginning then I am always searching for that part of the pattern. But overall cute pattern. Love this pattern. It's simple with great visual instructions and the end result is fab! You've done it again Oliver and S! 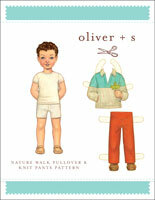 Oliver + S patterns always teach me something clever. In this case, adding a gathering stitch on the inside corners of the pockets to help turn the seam under. This same trick was repeated around the neckline; it was helpful in a size 2 but unneccessary in a size 8. A fitting note. I had to drastically adjusted the back crotch seam and back rise to fit the generous booty of my child. This alteration wasn't any easier or more difficult than other pajama pant patterns. The top would also benefit from adding cuffs to likewise accomodate the growing arm-length of a child. I will be making that change to the pattern the next time I make the top. Overall, I am extremely satisfied with this pattern and I will be using for as long as my children will allow me to make them Christmas pajamas. These were fairly straight forward and easy to make. I love that you can make which ever size you need for top and bottom, not having to match the sizes (like some patterns). I also love that there's no collar - makes it much more comfy for my kids! The reason I gave it 4 stars instead of 5 were: 1. Why are there cuffs on the pants but not on the sleeves? I had to go back and make my own to make it match properly. 2. There are several places where basting is recommended to fit the part to the pajama (e.g. pockets, collar). The instructions are OVER basting - most of the time, you can get away with very little or none. 3. Pockets can be squared off on the bottom and still look fine. I make lots of sleepwear for charity and have some very old patterns with this neckline. I have the larger sizes but needed the smaller ones which are hard to find. Especially with the open sleeve insertion. Bought this pattern as the sleeve and neckline were what I wanted plus the smaller sizes. I printed out just the top as I have a great pants pattern that I always use. I will be cutting the sleeves straighter than the pattern next time. I do not care for a tapered sleeve in pj's. Did not even look at the adjustment for growth, these are for charity and not many will even know what to do with that function. Putting the facing to the inside as that is how my old patterns were made. If I were making these for a specific child, I would go through all those hoops, but not when you are making numerous sets. Charity has to be sweet and simple and quick. I did not print out the instructions just put them together as I have for the past patterns and years. Very thankful to find this style of pattern. I made this pattern for my very small 7 year old grandson. It went together perfectly with no problems. I was able to make him the sz. 4 top and the sz. 2 bottoms - they fit and the pants don't fall off! Ready-to-wear pajamas never fit as he is so very small. I did lengthen the pants an inch. Highly recommend this pattern. While I haven't sewn the shirt yet, the pants pattern is perfect for flannel team pants! The grandkids love them! Like so many families, I wanted special pajamas to be part of our family's Christmas tradition. This year, my first born was too big to use the pattern I bought his first Christmas, so I repurchased the pattern in the digital format. I found it easy to use. The instructions are clear and concise, and the outcome is delightful. The cuffs make it easy for the pajamas to last two Christmases if necessary. The finishes are lovely, and as hand-me-downs they have survived dozens and dozens of wears and washes. We have a tradition of new PJ´s for Christmas and this year I wanted to make them for my 2,5 year old daughter. I opted for these bottoms but for a different top (after school shirt) because the jacket is (in my husbands words) "a bit old-gandpaish". I could totally see myself making the full set for a boy in the future. I made size 18-24m but lengthened to size 3y. That was really pain free. I used flannel and found that to work excellently. It frayed easily so I turned the long seams under and stitched them down. The pattern came together really nicely. One possible area for improvement would be to indicate up/down for directional fabric when piecing together the hem so that it looks its best when the hem is let down. It requires thinking a few steps ahead especially for a relative novice (yours truly). I loved making this and am eagerly awaiting more flanell for a second pair. I chose this pattern because I was specifically looking for one without a collar, and this fit the bill. I made three sets in two sizes. The instructions were clear and precise, with a couple of extra tips and suggestions that were helpful. One small (very small) annoyance -- the instructions referred to markings on the placket for buttonholes, but there were no markings, just a single dot, which I assume was to indicate placement of the top button. I have not yet given these to my granddaughters, but I'm sure they'll love them. I'm very pleased with the pyjamas, and will make them again. Another summer visit from the grandkids so I made two more pair. Love the instructions....only 5 hours start to finish. The 5 year old wore her jams all day after she put them on. So great to be able to print out the next size up each year. And to lengthen last year's pair by lowering the cuff on pants and sleeves. Thank you Oliver! I used this pattern to make my son pajamas. They turned out great! As usual the directions were great. I highly recommend. This is my favorite pajama pattern! The finishing are so nice. I made these for Christmas and my girls loved them! Another great pattern from Oliver and S! I'm excited for make more! So comfy and cute! A classic! 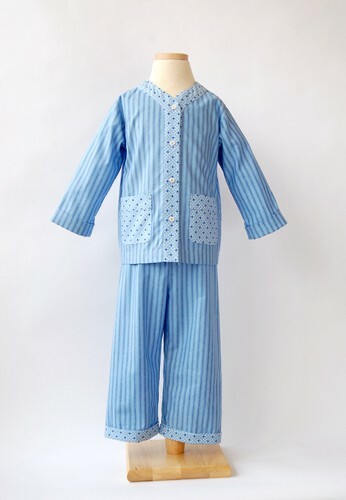 As I write this review, I am getting ready to sew my 4th pair of sleepover pajamas! That's how good they are! This is my first ever Oliver +S pattern! I find this pattern to run a little big though, especially because my daughter and her friends are tall but skinny. So for my skinny 3 year old I made a size 18-24 M in chest, waist and hip and 4T in length. And it's a beautiful fit now...looks every bit tailor made! I also found the pants to be too baggy in the 'crotch' area. So thanks to some excellent tutorials on the net, I reduced the crotch length in the back and front pieces by 2". That fixed it! Overall, they are beautiful! My daughter and her friends love them!! Just wish they were in my size too! 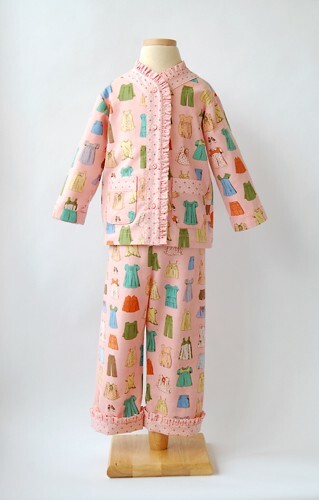 The Sleepover pajamas were so much fun to sew, with great, detailed instructions and lots of fun little details. I really loved the cuffs in the sleeves and pants and the length of the shirt, which will allow these pj's to last a long time. I made them in flannel which was deliciously cozy, and I think quilting cotton would be great for the warmer months. 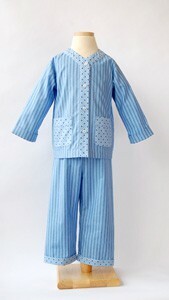 I just finished 2 pair of these pajamas for my grandchildren. They love them as much as I enjoyed sewing them. Excellent instructions! So nice to print out multiple patterns...This pattern will be good for another six years and won't take up any space in my sewing studio. This is the second pattern I have bought and I find the instructions clear, well written and easy to follow. I'm truly having a lot of fun sewing the pyjamas! No frustration whatsoever! Having 4 children I love how having a digital copy means I can have multiple sizes of the same pattern! Thank you for the prompts within the pattern on when to finish the inner seams so I don't have to lose the notches ahead of time by finishing all the edges or waste time on edges that won't be exposed on the finished garment. The PJs fit well on my kids with varying body types. I have used downloadable patterns from some of the major pattern manufacturers with only mildly satisfactory results. From the classic styling, exceptionally readable directions to the digital output and how the pieces register with each other, this was the best ever experience for me. This is my first choice for making all kinds of pants for my grandsons. Pajama pants in winter and then I adapt them for shorts in the summer. The best part is that there are no side seams so I can use large prints without ruining the design with a seam. I lengthen the and don't use the cuff but can add it when the pants get too short. I like the way the waistband connects to the pants and often sew it on the outside with contrasting material. I have only made these for one of my daughters but can't wait to make them for my son this winter. They are really cozy in flannel and fun to sew. In the first printing of the paper version of this pattern, the notch at the side seam on piece #2, the Pajama Top - Back was incorrectly positioned for all sizes. Please refer to the side seam notch on piece #1, the Pajama Top - Front, for the correct notch placement. This issue has been corrected in the digital version of the pattern. In the first printing of the paper version of the pattern, for the 6-12M and 12-18M sizes the pocket placement on the pajama top is a bit too low and will interfere with the hem of the top. To avoid this problem, raise the pocket placement by 1/2" for the 6-12M size and by 1/4" for the 12-18M size. This issue has been corrected in the digital version of the pattern. 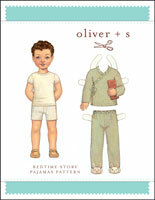 Discussion on the digital sleepover pajamas sewing pattern from the Oliver + S Discussion Forums. Find and share more photos on Instagram using the hashtags #sleepoverpajamas and #oliverands.